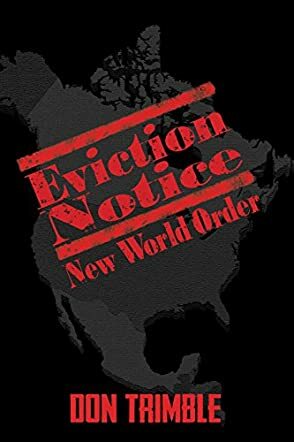 In writing EVICTION NOTICE: New World Order, the Author used his experience with a mandatory evacuation notice he and his wife received in Southern California during a fierce wildfire that displaced over 250,000 people, thousands of animals and vehicles. It was devastating. In one situation, a friend of his spent six hours in a line of cars, only to move two blocks, so he returned his family to their home and waited out the fire. This incident got the author thinking-- what would happen if hundreds of millions of people only had a few months to vacate North America. Thus-- EVICTION NOTICE. The author has worn many hats from being a varsity basketball and track and field coach, teaching science and geography, as well as spending over forty years in the hotel/casino industry, plus being a part owner of one for nine years. Even though Don Trimble does not have a military background, he is a crack shot with a pistol and rifle. He enjoys camping, hiking, biking, playing bocce, shooting pool, and, of course, writing books. But his favorite pastime is being with his wife and visiting their children and ten grandchildren as much as possible. The three books this author has written so far, HYBRIS, EVICTION NOTICE, and MURDER, are all based on facts. Reprogramming a person's subconscious is not only possible but doable; suing the president, U.S. Justice Department, etc. for crimes against humanity is possible; and developing a weapon that uses anti-matter and plasma as the projectile is also possible. Photons and electrons do go into another universe. Where? No one knows. It has been postulated that modern man made a giant leap a hundred or so thousand years ago, over a short period of time, one that is difficult to explain. Could extraterrestrials have helped out? And since eighty percent of the world's population believes in extraterrestrials, especially now that water and unexplainable objects have been discovered, many believing that Martians have visited earth is not too far-fetched. Even though parts of the novels may seem like science fiction, the author says to keep an eye on the future. Science fiction has a way of turning into reality. Greed and the thirst for unlimited power are the driving forces behind the effort to eliminate a large portion of the earth’s population in Eviction Notice: New World Order by Don Trimble. Beginning with North America, people are told, during an interruption of the Super Bowl game, to flee to other parts of the world or face annihilation. To prove a point, the host city as well as two others on the continent are vaporized. T. Hill Mansfield, his wife, Renee, their family and friends take this directive seriously and head for the coast of California. There, they are able to find a way off the mainland and undertake a hazardous journey around the world to property they own in France. Fortunately, their background and abilities, due to their experiences at Mind/Body Control Training centers, enable them to overcome numerous obstacles on the way to what they hope will be safety. When the truth behind this loss of life and destruction becomes known, this group is picked to confront the problem and return control of the governments to the people. How they will be able to defeat apparently insurmountable opposition is an issue that means life or death for billions of survivors. Conspiracy theories come true in this amazing story about the fight to survive. Don Trimble addresses the question of who or what is really controlling events across the world in Eviction Notice: New World Order and he uses history and current events to move the plot along. With a healthy dose of science fiction, the characters make the struggle many people feel every day come alive. After reading this book, you may wonder where fiction ends and non-fiction begins.